Our family's staycation at the Novotel twin waters resort. This Christmas break, we decided to try something a little different. My kids really enjoyed a holiday without the normal hassle. When you’ve got kids, taking a holiday can be a tricky exercise. You pack up half the house, drag it through the airport amid constant cries of “are we there yet?”, only to be greeted by complaints of boredom and hunger when you finally do arrive. But determined to have a family holiday this Christmas break, we decided to try something a little different, a little closer to home without the need for hours of prior preparation. Armed with nothing more than a couple of changes of clothes, swimmers, sunscreen and my baby’s bottles, we took a short, two hour drive to the Sunshine Coast for a two night staycation at Novotel Twin Waters Resort. While driving into the resort, I was taken aback by its location. Like an isolated oasis, the resort is surrounded by stunning water views and evokes a feeling of total tranquility. The rooms are large and include a kitchenette, bathroom, bedroom and living room which opens onto a grassy park area opposite a secluded sandy beach – perfect for the kids to play and explore, with two deck chairs for mum and dad. The best part about staying at a resort like Novotel Twin Waters Resort is the fact that it is DESIGNED for families so there is actually something for the kids to do. Most parents could relate to arriving at a stunning location, checking in to a beautiful hotel, only to be trapped in your room while the kids play on their iPads because there is just nothing for them to do. At Novotel there was plenty. So much, in fact, that you really need to write yourself a little itinerary to make sure you fit everything in. The first thing we did was hit the pool. Just as an FYI, you should know that this post is sponsored by Novotel. But all opinions expressed by the author are 100% authentic and written in their own words. Divided into sections, the pool had three shallow areas, perfect for my four and five-year-olds to swim and play freely, while we could either jump in with the bubba or grab a drink or snack from the fish and chip shop located right on the deck. The kids had an absolute ball and we easily spent several hours swimming and relaxing as a family before heading back to the room where the kids chilled out watching Nickelodeon while hubby and I got ready for dinner. For me, one of the best aspects to taking a holiday is not having to cook. But at Novotel Twin Waters Resort you don’t have to venture out to have a decent meal. We arrived at the resort’s on-site restaurant Nouveau and were greeted with an enormous carvery buffet offering all types of meats, vegetables and salads along with to-die-for desserts – a major highlight for my two boys who were kept thoroughly busy getting through their servings while my partner Paul and I enjoyed a bottle of red. The following morning we took off in the same direction to tuck into the buffet breakfast – my favourite meal of the day – which included a wide variety of options. None of us left hungry as we headed back to our room to make a plan for the day. First up was a visit to the resort’s amazing inflatable Water Park. Suitable for children over five, my eldest couldn’t believe his eyes and had an absolute ball with his dad, while I took the little ones for a swim in the pool. While everyone was in adventure mode, Paul took the boys on the resort’s catamarans, followed by a kayak ride, while I was able to enjoy a bit of one-on-one time in the sun with my ten month old baby girl. But it’s not just the kids having all the fun. 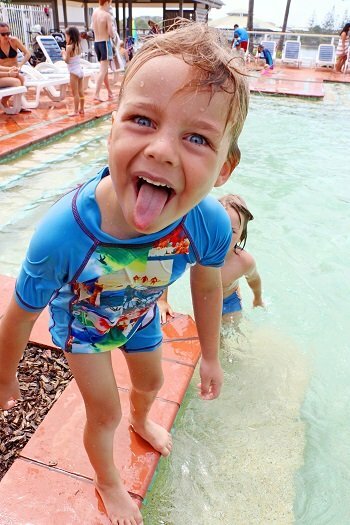 Novotel Twin Waters Resort offers a care service that kids love, giving parents some well-earned time to do whatever it is they want to do. Enjoy a few cocktails, take a swim, read, lie in the sun, hit the on-site day spa or head back to the room for some private time – the choice is yours. After a casual pizza lunch, we took the boys over to Kidz Cove. Yes. This really happened. UNINTERUPTED. Although they can be a little clingy at times, the ladies at Kidz Cove made the boys immediately comfortable, giving me the peace of mind I needed to enjoy the time to relax with Paul. With baby Lee sound asleep in her pram, it was heaven to just lie uninterrupted on a deckchair by the pool with a glass of champagne and some adult conversation. When the time came to pick the boys up, neither wanted to leave, having spent time face painting, playing outside, eating snacks, watching DVDs, and playing with a little guinea pig… I pretty much had to bribe them with food. Which was easy to do considering we were heading back to Nouveau. Only this time when we arrived it was a South Western night with an array of tasty Mexican dishes and curries, salads and sushi. And of course the endless desserts which we all endured despite being close to bursting from dinner. After finishing our meal we walked outside to find an amazing and totally unexpected display of fireworks lighting up the sky. A spectacular way to end a perfect day. The following morning we enjoyed another of Novotel’s delicious breakfasts followed by one last swim and another kayak ride for the boys. By the time we packed our few belongings and got back into the car, we all felt as though we’d been a million miles away. People often forget that we’re lucky enough to live in one of the most beautiful countries in the world. It can be tempting to jet set around in search of an idyllic location. But in reality, there’s simply no need to go to all that effort, or put the kids through the anguish of airport travel, when you can experience true paradise in your own backyard. At Novotel Twin Waters Resort, we really did feel as though we were holidaying at an isolated oasis. We had access to the beach, pools, a day spa and gourmet dining, as well outdoor adventure activities – and all in the comfort of beautiful resort style accommodation. We felt refreshed, energised and connected as a family. The kids were happy. We were happy. And that’s what makes a truly special holiday. How do your kids handle family holidays? The Staycation by Novotel is all about exploring your own city or state. It is not always possible logistically or financially to getaway so why not holiday at home? 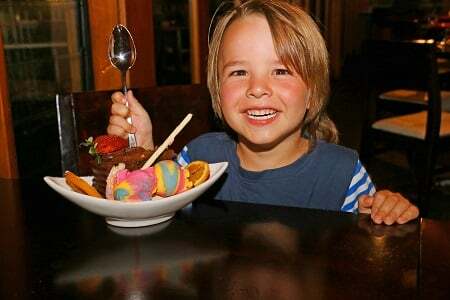 Kids ADORE going to a hotel and with room service, movies, buffet breakfast & best of all, no cleaning up; so do parents. At Novotel, your kids are personally welcomed with a special gift on arrival and they stay & eat brekkie free. You can also enjoy a sleep-in with a late 5pm checkout on Sunday giving you more time to explore, plus when you book 21 days in advance, you could enjoy up to 30% off.